A Syrian man under US sanctions for assisting President Bashar al-Assad’s regime received residency status in Hungary under the controversial “golden visa” scheme launched by Prime Minister Viktor Orban’s government, according to reports. Direkt36 and 444.hu reported in a joint investigation on Wednesday that Hungary had given a residency permit to Atiya Khoury, who the US Treasury Department accused in 2016 of paying for fuel procurements for Assad’s government. The department said at the time that Khoury operated a firm called Moneta Transfer & Exchange and moved cash between Syria, Lebanon and Russia on behalf of another man, and with authority from the Syrian government. He paid for the fuel procurement using the company and received a commission for the transactions, it said. Khoury's permit was reportedly given under the “golden visa" scheme, which granted those who invested €300,000 in Hungarian state bonds a Hungarian residency permit. The report also said Syrian national Salmo Bazkka, who is suspected by Italian authorities of being a member of an international money laundering network, procured a permit under the same scheme. The report did not say exactly when the pair received the permits. The Hungarian government told Euronews that the article was politically motivated and a “fairy story” because one of the people it named was already a resident in the country during the governments of former prime ministers Ferenc Gyurcsány and Gordon Bajnai. It added that it “does not wish to concern itself with election scams,” as it referred Euronews to an Interior Ministry statement, which said the goal of the article was to “manipulate public opinion” prior to the April 8 election. Hungarian MP Marta Demeter of the LMP Party, a Green party, told Euronews she had received confirmation that Khoury received a permit under the scheme from the Immigration and Asylum Office. Demeter visited the office on Thursday to attempt to look through the documents of the two Syrian men, but claimed she was refused access despite her "parliamentary right". Khoury then requested a life-long permit at the end of 2016, which was granted at the beginning of the following year, she was told, adding that security checks did not flag any issues. “To my question about whether or not the Hungarian authorities would revoke Khoury’s residence permit in light of the new information, the director said ‘no’. She said she thinks its still not enough reason for the Hungarian authorities to do this,” she said. Demeter said she was told that Bazkka did not receive his residency under the “golden visa” scheme, having arrived in Hungary in 1998 and been awarded a permit in 1999. Bazkka got lifelong residency in 2010, she said. “The director said it’s not in the construction of the ‘golden visa’ programme but I was not able to check this statement because I was not allowed to see the documents,” she said. The immigration office did not immediately respond to Euronews requests for comment. 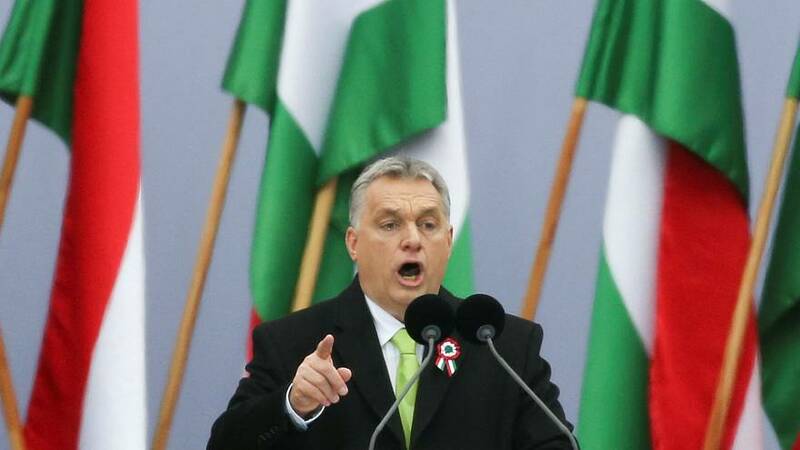 The allegation that suspected criminals were able to buy residency in Hungary has come at a sensitive time for Orban’s right-wing government, which has been campaigning on a hardline anti-immigration platform ahead of the election. According to official figures, the “golden visa” scheme saw some 6,585 foreigners and their 13,300 family members granted permanent residence permits between 2013 and 2017. “They are hiding criminals and giving passports to them to move freely in the whole Schengen Zone,” she said.